Pecan pie is my weakness, especially around the holidays...it's one of those "I guess I'll have another slice" type of pies for me. With these mini pies, maybe it will take a little longer to go through 5 or 6 servings! Preheat oven to 325* F .
Grease 30 tart tins or muffin cups and set aside. To Make Crust: In a medium mixing bowl cream together cream cheese and 1 cup butter until light and fluffy. Blend in flour, 1/2 cup at a time, forming a smooth dough. Roll into 30 equal balls and press one into each greased tin so it lines the bottom and sides, like a pie crust. To Make Filling: In a medium mixing bowl cream together 1/4 cup butter and sugar until light and fluffy. Beat in eggs and vanilla until thoroughly blended. Stir in pecans. Fill each lined tin half full. (Mixture will rise as it bakes.) 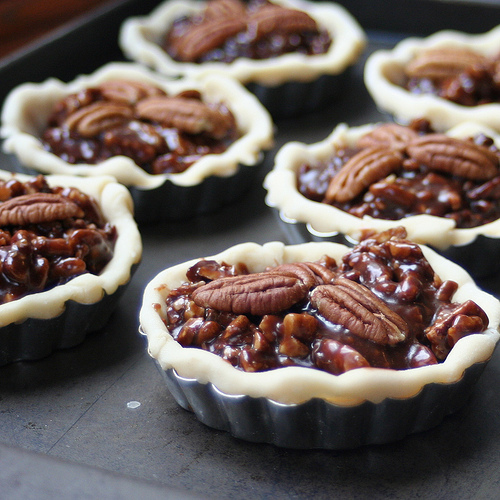 Top with 3 Pecan halves. Bake in preheated oven for 25 minutes, or until lightly browned. Let cool in tins, then use the end of a table knife to flip each tart out of its tin.